A block of flats weakened in floods that hit Tyneside more than 18 months ago has been demolished. 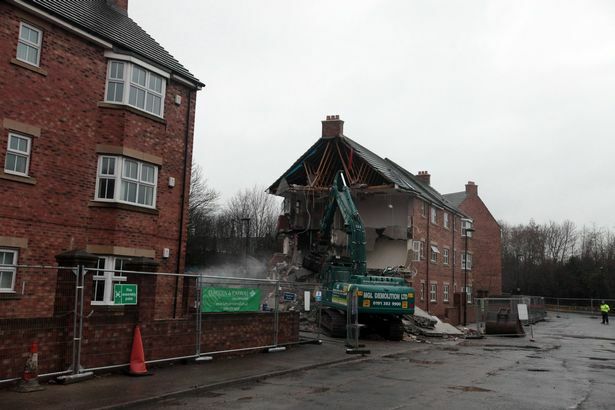 The apartments at Spencer Court in Newburn, Newcastle, were knocked down yesterday, just over a year after a neighbouring block was also demolished after four major floods in 2012 weakened the ground under the estate which is less than a decade old. 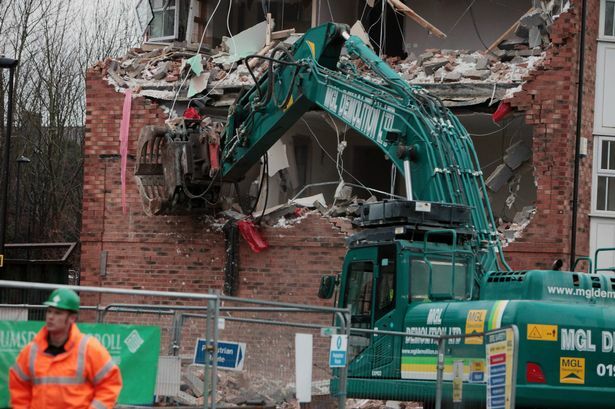 An early morning operation saw demolition crews tear into Block B of the Spencer Court, smashing brick and crunching glass and metal as the building quickly tumbled. Afterwards the estate’s developers assured people with houses on the estate - many of whom are still to return - that no more blocks would have to come down. Dunelm Homes director Geoff Woodcock said the 18 families who are still to move back to the street’s blocks A, C and D should not fear a repeat of a catastrophic culvert collapse that has caused the problems. He said: “What we found in our surveys was that much of the land was repairable. Under blocks A, C and D we have injected grout – cement to hold the soil together. But the problem with block B was that the corner of it nearest Walbottle Road has dropped by 170mm. “When the culvert first collapsed it dropped 120mm, and then with every successive inundation it has dropped further. The wrecking arm made swift work of demolishing the six flats of block B, with half of the building levelled within an hour. But the work is one of the final stages needed before the families in the 18 flats of blocks A, C and D can return, and Mr Woodcock said they can come back with confidence that the flooding will not return. He said that due to the damage caused during the collapse, both Northumberland Estates and Dunelm had not merely repaired the culvet, but effectively replaced the entire underground stretch of it, and so he felt people could be confident flooding would not return.